Make It Cheaper helped New Touch Laser Cutting negotiate competitive rates for their energy needs. New Touch Laser Cutting began in 2001 as a two man operation and has rapidly grown to become one of the industry’s premier companies. Currently operating 6 machines, 24 hours over two locations in Bayswater and Clayton South. 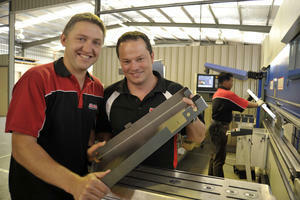 New Touch Laser Cutting is renowned for providing high quality laser cutting & marking services at competitive prices. We offer an expanded range of services to meet your Laser Cutting & Fabrication needs. Brad Drury the co-owner of New Touch Laser Cutting along with the Operations Director, Alex Vandenbroeck, came to Make It Cheaper after seeing the new partnership being spoken about in the April edition of the AMT magazine, the commercial energy contracts were coming up for renewal so it was perfect timing. "I chose Make It Cheaper as they are the official energy partner for AMTIL, I know that if my association is recommending a service it is usually for a good reason. All I had to do was ring the 1300 number and get through to one of the experts. "We would strongly recommend your services to others and especially to readers of AMT and members of AMTIL." It’s great to see our expertise pay off – by helping another company to cut out the time and hassle of setting up a new energy contract, we’ve enabled them to focus on achieving their own goals for growth and productivity.